Scared Stiff is a remake of the Bob Hope and Paulette Goddard comedy, The Ghost Breakers, with Dean Martin as Larry Todd, a singer who is falsely accused of murder (“You murdered a perfect stranger?” “Nobody’s perfect.”). He is on the run from the law, accompanied by his friend Myron M. Mertz (played by Jerry Lewis). On the lam, they run into Mary Caroll (Lizabeth Scott), who has inherited a haunted castle from her father, where the three of them go. 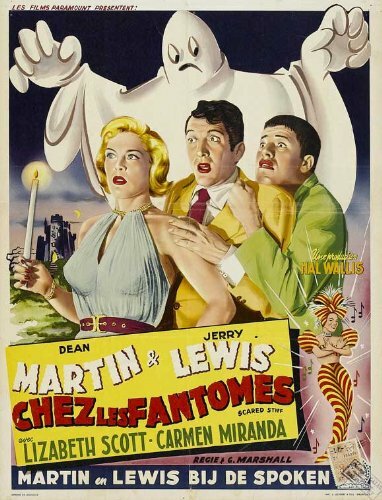 Once there the “ghost” makes his appearance, Dean sings, Jerry does slapstick — including an imitation of their co-star, Carmen Miranda. Larry Todd (Dean Martin), and Myron Mertz (Jerry Lewis), cross paths with a gangster named “Shorty” when Larry hits on Shorty’s girl. After fleeing from Shorty, they meet an heiress (Lizabeth Scott) who is sailing for Cuba. One unexplained murder and threatening note later, Larry and Myron sail with her to the island. Once there they cross paths with a zombie and other mysterious happenings. Eventually, they discover the person behind the mystery and rid the island of him. The movie ends with a cameo appearance by Bing Crosby and Bob Hope. Dean Martin’s performance of I Don’t Care If The Sun Don’t Shine was the influential version of the song, which became Elvis Presley’s second Sun single in 1954. George Marshall also directed the earlier version of this film (The Ghost Breakers). The last film of Carmen Miranda’s career. When he looks around the gloomy gold mine, Dean Martin says, “Reminds me of my hotel room in Steubenville.” Martin’s real-life hometown was Steubenville, Ohio. The previous year Martin and Lewis had made an uncredited gag appearance in Bing Crosby and Bob Hope’s The Road to Bali. Hope and Crosby return the favor with a cameo in this film. Feature film writing debut for 1970’s television mogul Norman Lear.